1. Set a budget to find out what you really need. What you need will depend on where you live. If your dream grad program is in New York City, your living expenses will skyrocket. Don’t forget to factor in moving costs and the fact that you may not be employed in the summers. 2. Turn to the school and the government first. Did you fill out a FAFSA? Good. You should receive information soon on how much the school can give you and if you are eligible for government loans, like Stafford or PLUS loans, that offer fixed rates. 3. Steer clear of private loans. This is your dream and you can’t turn it down. Okay. But you should still beware of private loans. Haven’t you read Dickens? If you don’t have time to read Dickens, read this article from Kiplinger, which describes how students get hooked by a teaser loan rate that can balloon later on. 4. Call the financial aid department to discuss your package. Financial aid departments are understaffed, but being aggressive and discussing your options can’t hurt. You may also want to call the department that accepted you to find out if there are any extra jobs you can take on campus. 5. Weigh what you’ll make against your debt. Let’s assume you get a job. (Better yet, don’t … but let’s be optimistic for the sake of the exercise.) You’ll probably be making between $50,000 and $60,000 as an assistant professor. If you graduate with that much in student loans, how are you going to take care of yourself over the years? If you can’t swing that, choose a program that offers better funding, or start negotiating with the school to get a better deal. 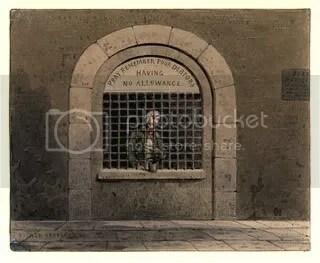 Image of debtor from public domain, Wikimedia Commons. Subscribe to comments with RSS	or TrackBack to 'The Grad Student Loan Trap'. Since student loans start coming due once you graduate, it’s particularly tough on folks who don’t have anything lined up after the Ph.D. While it’s tough enough for junior faculty making around $50,000 let’s say to pay off loans, think about those who have no jobs after finishing and are lucky to scrape together a few lecturing positions to make a little more than they did as grad students.